Me? A 17 Year Old YOG Cheerleader? 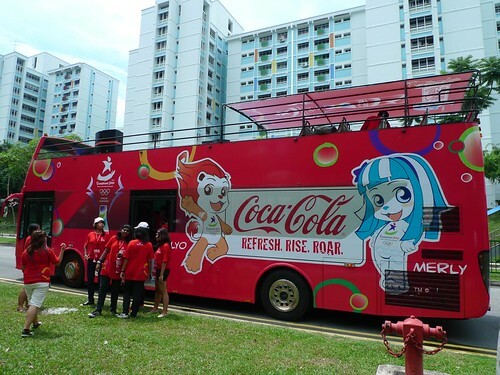 That was my first reaction when invited by June Kong-Dhanabalan from Coca-Cola to hop on board their Happiness Mobile (Coke is the official worldwide sponsor of the games). 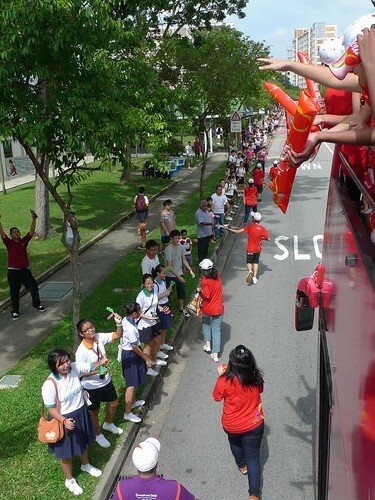 Offering a bird’s eye view of the Journey of the Youth Olympic Flame (or JYOF), I will feel what it’s like to be a teenager hollering my lungs out, waving my hands in the air, and cheering on an open-top “Hippo” bus. Of course, I was heartened to know that the blogfather mrbrown has already experienced this. 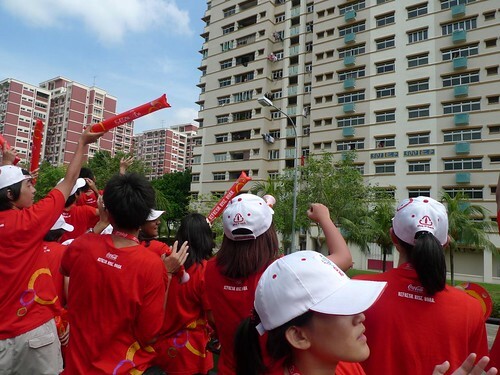 Held in conjunction with the upcoming Singapore Youth Olympic Games (YOG), the Singapore leg of the torch relay sees some 2,400 torchbearers (including June herself) conveying the Youth Olympic Flame through all the five community districts and ending in the heart of the city. 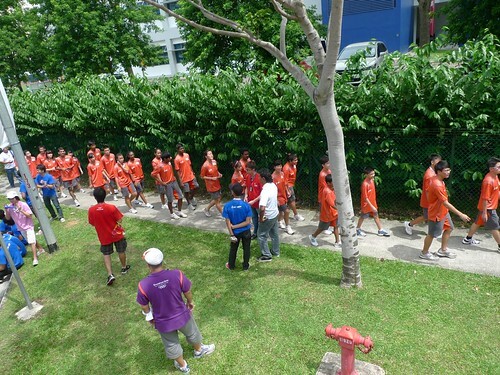 Participants hail from the 500 odd participating schools, sponsoring organisations, as well as government agencies. How was the experience like? Well, let me bring you on a pictorial journey. 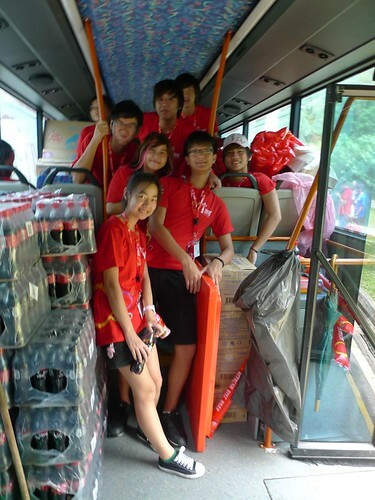 Real teenagers (most came from Nanyang Polytechnic and other institutions) on board the Happiness Mobile/bus, stashed with lots of goodies like clappers, caps, fans, and of course bottles of Coke. 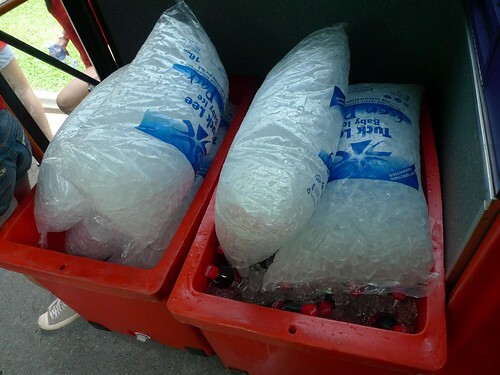 Nothing beats the tropical heat like heaps of ice-cold Coke! 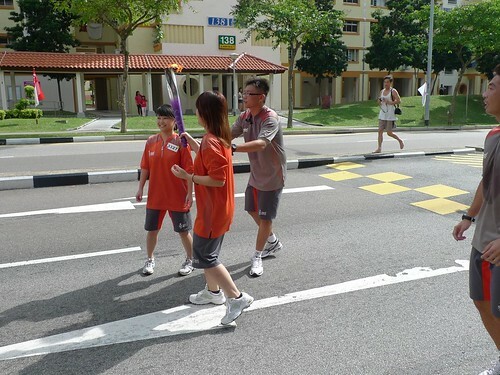 These folks in orange are the selected torchbearers who were stationed at respective posts during the journey. A close-up view of an air-inflated clapper. 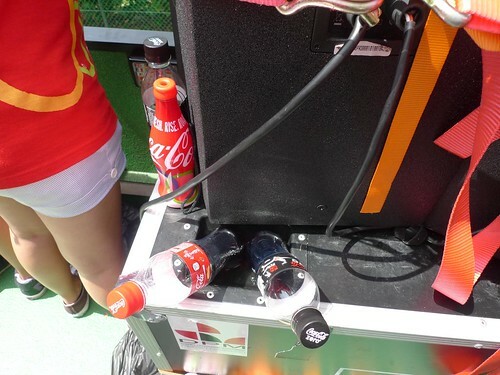 These boom boxes played helped to keep the energy high (along with the caffeinated ice-cold Coke drinks of course). 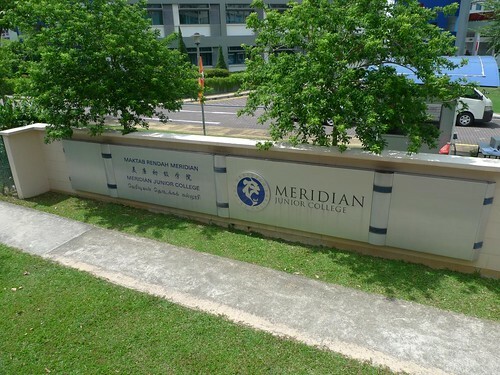 Our journey started from Meridian Junior College. Here you can see some of the cheerleaders waving their hands and clappers. 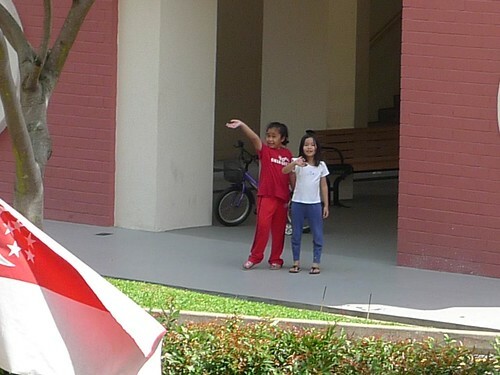 Some of the bystanders waved back at ground level, like these two girls here. 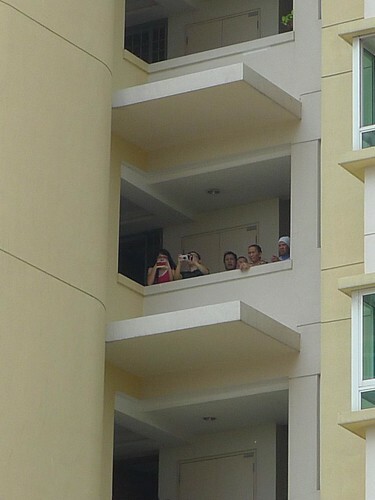 Others caught the action perched high in their flats. 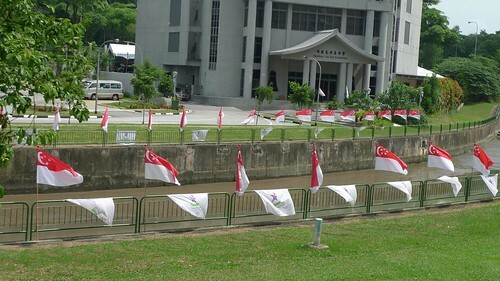 These waving Singapore flags provided clues that National Day has just passed. 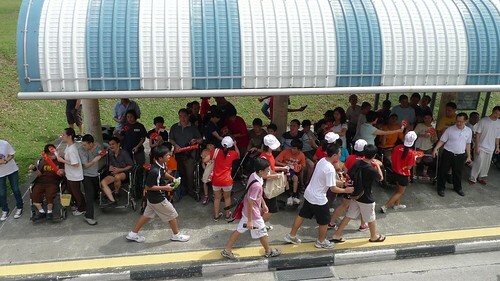 It was great to see that people with disabilities also joined in cheering the convoy as it passed. Incidentally, 34 beneficiaries from VWOs were also selected as torchbearers. 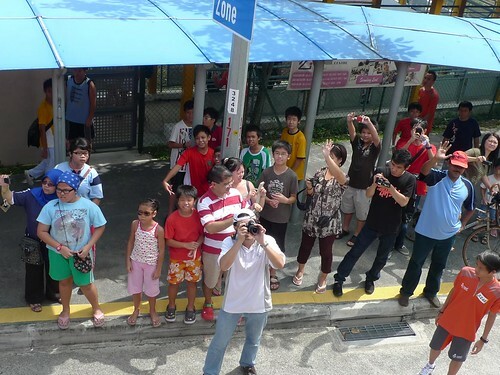 I felt like a celebrity – cheerleader or cameraman – as lots of people in the crowd tooks photos of us. 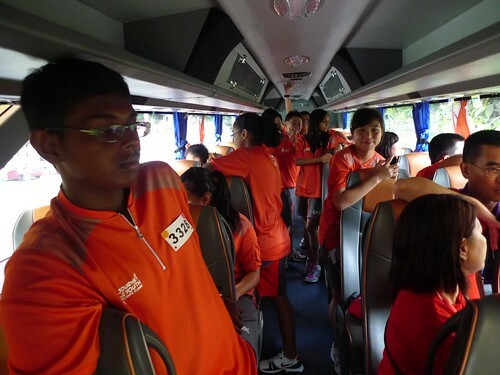 Adrenaline levels remained high on board the bus, despite the sweltering afternoon heat. 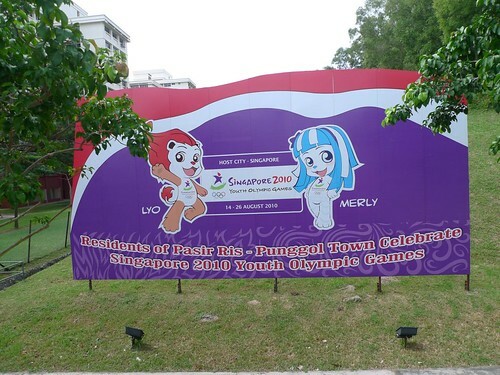 This banner showed Pasir Ris-Punggol Town’s support of the YOG. 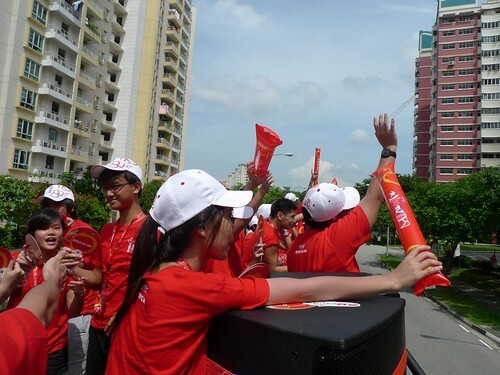 The student volunteers decked in red hopped off the bus, distributed Coke-branded goodies, and ran on again. 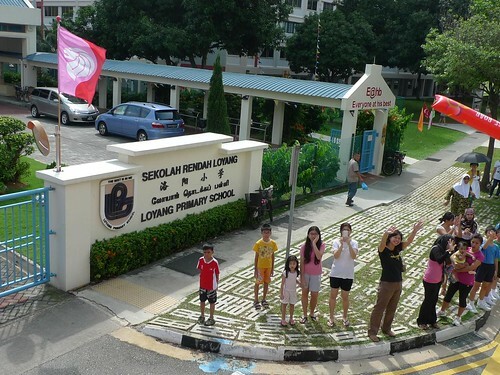 We passed by various Junior Colleges, Secondary and Primary Schools. 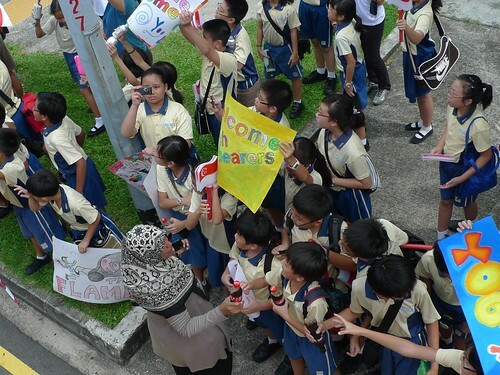 Most of them mobilised their teachers and kids to form cheerleading squads as the convoy passed. Some even came prepared with their own banners. 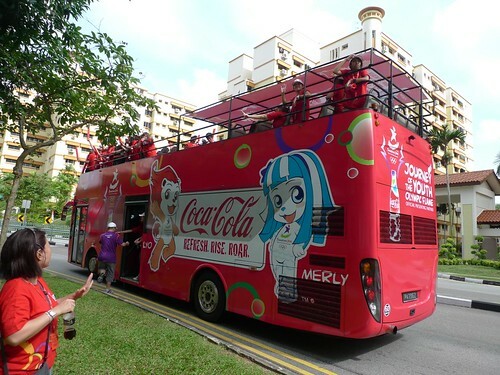 After an hour and a half or so, June and I hopped off the Coke Happiness bus. 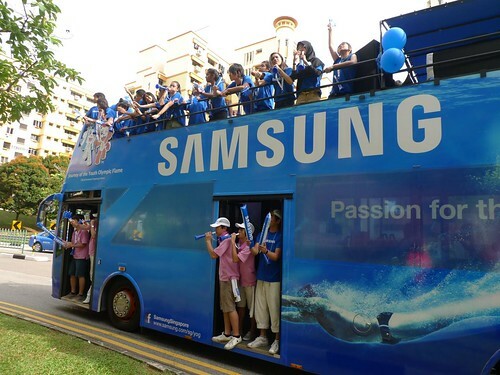 Following us in blue were our friendly counterparts from Samsung Singapore. I am sure Daniel must be involved in this somewhat. 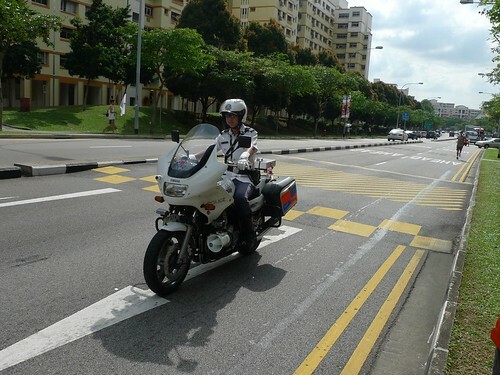 These mobile outriders (aka traffic police officers) worked tirelessly to ensure that the safety of the torchbearers. 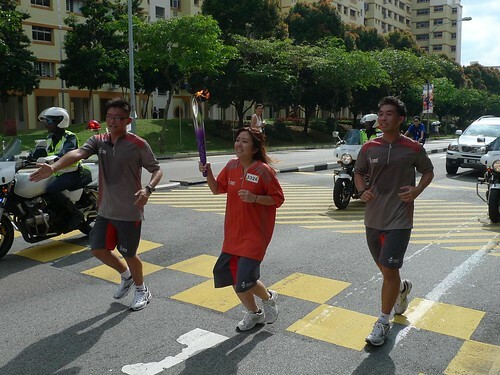 I finally caught sight of a torchbearer, running to pass the torch to the next person in line. At that point of time, June and I hopped on the YOG coach to catch an air-conditioned ride. 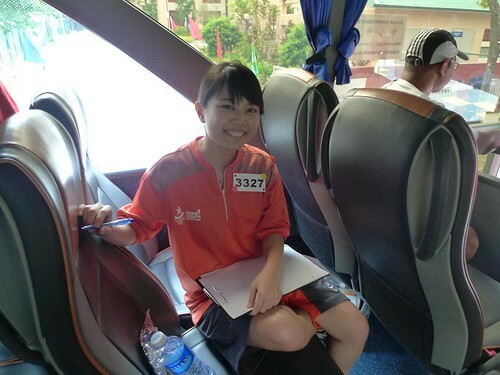 Here’s a smile from one of the hardworking torchbearers. She is about to write her feelings and thoughts on participating in this historic event on the writing board. 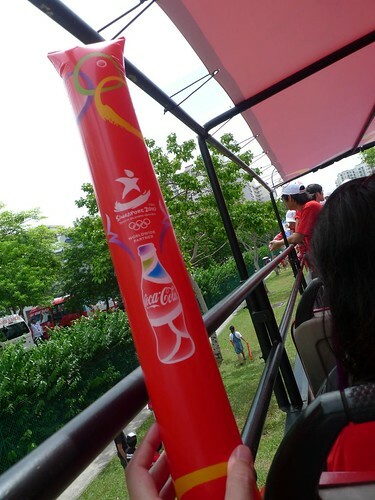 Other fellow torchbearers in the bus chatting animatedly about their experience as flaming ambassadors. Well done guys and girls! We were greeted by a huge crowd at the stop point who were young, old, multi-ethnic and truly representative of our society. 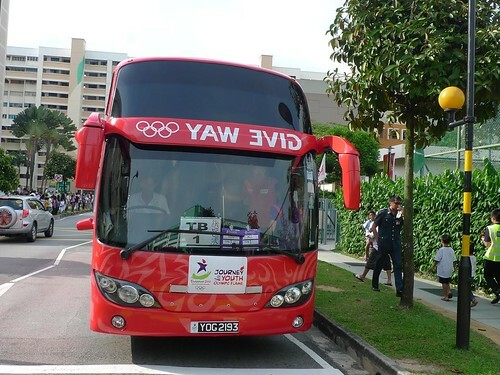 It was nice to see such support of the YOG in Singapore. If you haven’t already done so, go get your tickets now! So Fake!!! And you are proud? 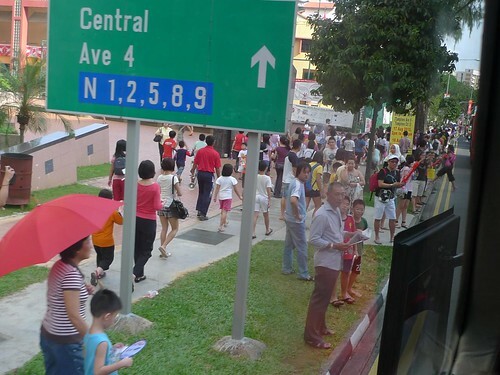 Look at the guy in purple walking along the side of the bus, ánd you’ll soon understand his job. You very funny lah you. Hi! Thanks for the pictorial journey! I would like to check if you received the YOG coca-cola box set? hi may i check with you do you still have YOG coca-cola box set? ?